Eating healthy but still not seeing the scale budge? It could be a matter of making a few simple tweaks. As Instagram user Amanda Meixner (@meowmeix) proved, there are some so-called “healthy” foods that could actually be adding to your overall daily calories and halting your weight-loss progress. 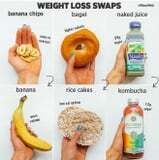 Rather than eating a high-calorie bagel, opt for a couple of rice cakes – she suggests eating them topped with almond butter and a few slices of fresh banana. “Some bagels contain 14+ ingredients and often have added sugar. If you’re trying to lose weight, a rice cake is a much better, low calorie option,” she wrote in the caption. And even though store-bought bottled smoothies may seem like a healthy choice, they are usually packed with sugar, sometimes more than 50 grams, and up to 270 calories. Instead, sip on kombucha, which only has about 12 grams of sugar and is 50 calories. Remember: just because a food is marketed as healthy doesn’t mean it’s always the best choice, especially for weight loss. By making a few easy swaps, you could save hundreds of calories and reach your weight-loss goals in no time.